Revamp your fruit tray this summer and build these 4-ingredient watermelon cameras equipped with flip out screens. To capture precise audio, there’s even a shotgun microphone made of blueberries and blackberries. And, for ultimate protection, I’m using removable honeydew lens covers! This isn’t your typical fruit tray. 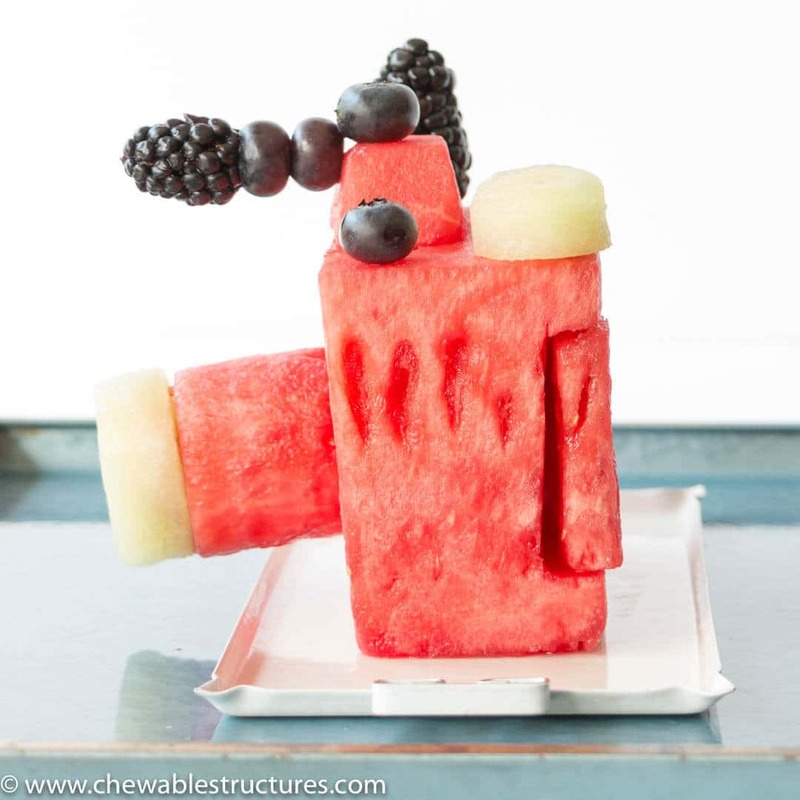 Switch up a dull fruit tray and build this adorable watermelon camera with a flip out screen. You might be wondering of all the things to build, why an edible camera? I want you to meet Yuka Ohishi, a fellow creator and video camera fanatic. When we first met, we instantly bonded over our mutual love for camera flip out screens. After nerding out on our fave video accessories and YouTubers, it was clear that we needed to join creative forces to film and eat a video project together. Since summer is almost here, building a fruit tray of edible watermelon cameras was a perfect fit. Watch Us Build The Watermelon Camera Below. During our video shoot, and between all of my giggling, Yuka told me about her cool new initiative that she’s “trying to push out into the Universe.” It’s called the #weekendcreator. Yuka says that since she has a full-time job at Pinterest, she ends up creating and exploring on the weekends. And, although she’s not a designer or artist, she wants to inspire others to live a more creative life too. As a fellow creator, I fully relate with Yuka’s #weekendcreator initiative. Years ago, I was a design engineer by day and a video enthusiast by night. At the time, I started a YouTube channel where I did fun science experiments. The storytelling process mesmerized me. Before I knew it, I had submitted my two weeks notice and enrolled in journalism grad school. I wanted to learn how to tell stories through videos. In retrospect, years ago, carving out time to be creative on the weekends is what eventually led me to creating this Chewable Structures blog. For more details about Yuka’s adventures as a #weekendcreator, check out her Blossomlink blog. And, make sure to follow her on YouTube, Pinterest, Instagram, and Twitter. Also, big thanks to Pinterest for hooking us up with their stellar Workshop, which is a creative studio designed and built for creators. Last year I had a blast performing a cooking demo in the Workshop and building stackable gummy bricks with Pinterest engineers. But, this was the first time I had ever filmed in their creative space. Since I film my food videos in a tiny kitchen, I’m usually squeezing my way through an obstacle course of tripods, cables and lights. It’s safe to say that it was a special treat to spread out our two-camera video shoot in the Workshop. For more info about the creative space, check out Aimee B’s blog post here. Ok, so now that you’ve seen our fun videos, you’re probably wondering how to build this thing. Buckle in, here we go. It starts at the store. Choose the biggest watermelon you can find. Mine is around 15 pounds. I like to trim the rind off until a solid block of pink fruit forms. Using a ruler– because I like precision– I chop the block into four smaller blocks. By this time, the kitchen smells like summer. See the recipe below for the exact dimensions. After that, the only real carving left on the list is to cut the flip out screen in the back and the attachment on top of the camera for the shotgun microphone. The attachment is that little watermelon section on top of the camera that looks like a 3-D trapezoid in the below image. Check out this flip out screen! You need to build this fun fruit tray. Next, I set aside my knives and I just use circle cookie cutters to cut out the watermelon lens, honeydew lens cover and honeydew mode dial. If there’s any confusion, the mode dial is the honeydew section on the top right corner (just above the flip out screen) in the image below. This side view of the watermelon camera really shows off the blueberry and blackberry shotgun microphone and watermelon flip out screen. This is also an adorable baby shower fruit tray. From here on end, it’s all about piercing blueberries and blackberries with toothpicks. Plus, all the camera sections are attached using toothpicks too. This Ateco 4845 Plain Edge Geometric Shapes Set is a staple in my food art toolbox. For the watermelon lens and honeydew lens cap, I’m using the largest circle cookie cutter. For the honeydew mode dial (on top of the camera), I’m using the medium circle cookie cutter. I like this specific Ateco set because there are graduated sizes of a bunch of shapes, including: circle, triangle, diamond, square, rectangle, hexagon and octagon. Check out the full recipe below and watch the first video above for a better visual idea. If you’re looking for more fruit tray ideas, then check out my adorable watermelon fruit train recipe. This is also an adorable baby shower fruit tray. What do you think about my fruit tray? Do you have any cool fruit tray ideas? If so, leave a comment below. Revamp your fruit tray this summer and build these 4-ingredient watermelon cameras equipped with a flip out screen, shotgun microphone, and more. It takes 25 minutes to carve and only requires toothpicks to attach the watermelon, honeydew, blackberry and blueberry sections. 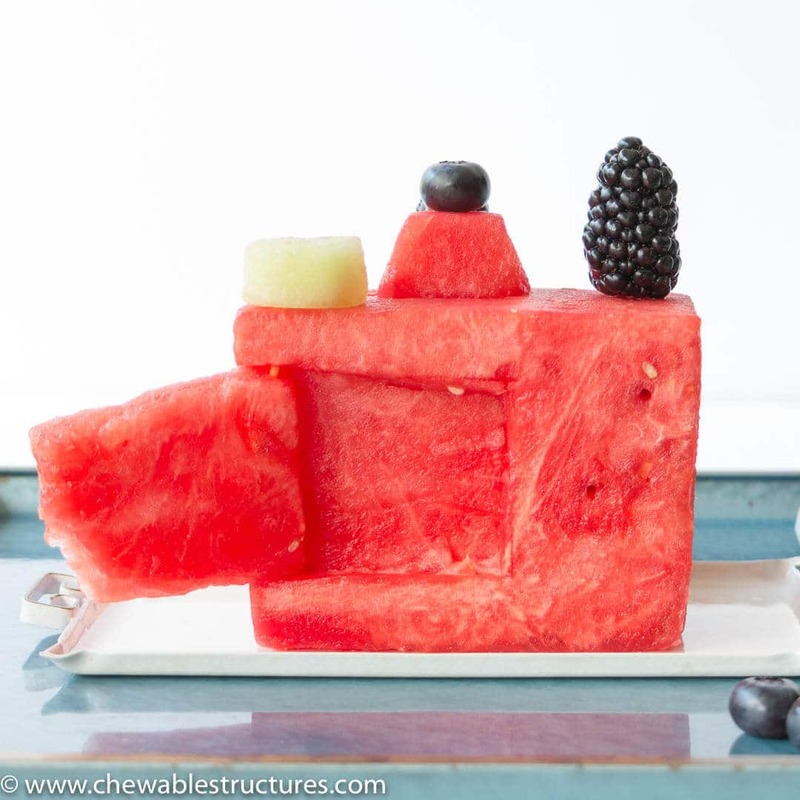 Camera Body: Cut watermelon blocks that are 4-inches wide by 3-inches tall by 2-inches thick. As a benchmark, I carved four watermelon blocks out of my 15-pound watermelon. Save all the yummy watermelon scraps for fruit salad. Attachment for the shotgun microphone: Carve a 3-D watermelon trapezoid. Start off with a watermelon block that’s roughly 1.5-inches wide by 1.5-inch tall by 1-inch thick. Using a pairing knife cut the sides of the block while placing the knife on an angle. (See blog post images). Using a toothpick, attach the 3-D watermelon trapezoid to the top of the camera body. Place a blueberry on top of the same toothpick. Shotgun microphone: Add two blueberries and one blackberry to a toothpick and secure it to the attachment (in step 4). Mode dial: Cut a 0.5-inch thick honeydew section using a 1.25-inch circle cookie cutter. Menus on the back of the camera: Add two blueberries to each toothpick. 10. Flash: Add one blackberry to a toothpick. 11. To assemble each section of the camera, watch the video tutorial in Step 1. 1. This recipe describes how to build four large watermelon cameras. 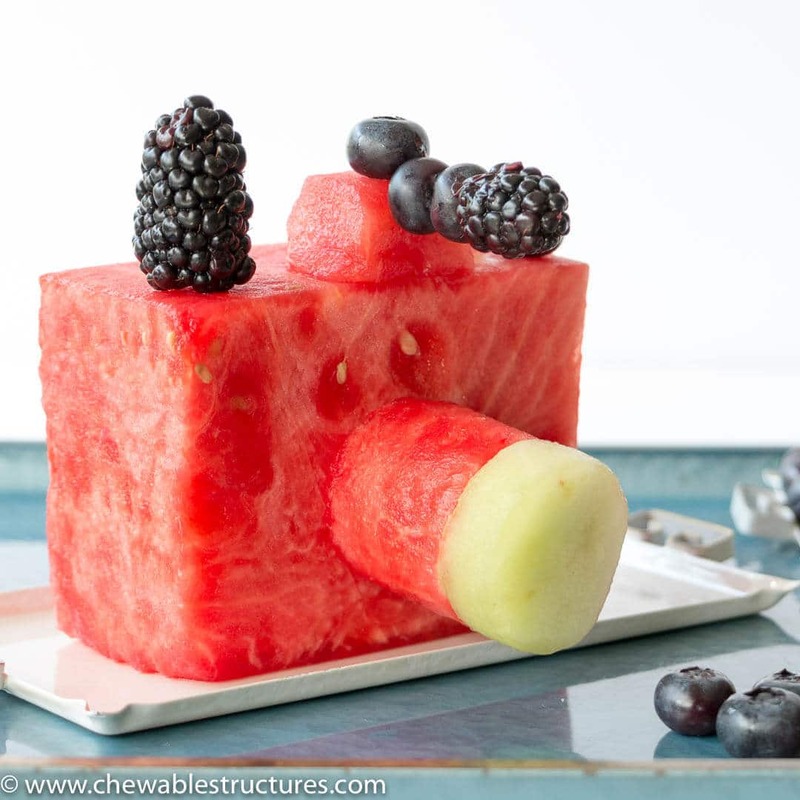 If you want smaller cameras, then carve watermelon blocks that are 3-inch wide by 2-inch tall by 1.5-inch thick. If the thickness is less than 1.5 inches, then it’ll be difficult to carve the flip out screen. Also, the structure might topple over when you add the watermelon lens and honeydew cover. 2. I’m using the circle cookie cutters in this Ateco 4845 Plain Edge Geometric Shapes Set. Thanks for sharing, Paul! It’s so much fun building an edible camera.